Sony KDL-52HX903 review | What Hi-Fi? The portents for the '52HX903 are good, as you'll know if you've already read the review of its 46-inch sibling, the Sony KDL-46HX903. After all, if this behemoth can do what its Award-winning sibling can, but on a greater scale… well, what could be wrong with that? That's one way of looking at it. The other way is to ask if an extra £1000 can possibly be justified for an extra 6 inches of screen. In spec terms, this Sony has most of everything. Full-array LED backlighting, Freeview HD, 400Hz motion processing and a raft of connectivity make it enticing even before you've seen it in action – though we can't help thinking the need for a cost-option 3D sync transmitter is both a bit of a liberty and doesn't help the product's looks. Sixty quid for the transmitter, £100 a pair for glasses and £70 for a wi-fi adaptor makes a pricey TV even costlier. Should we find ourselves at the checkout with £3500, we'd want them thrown free. In terms of performance, though, there's little fault to be found. Sony has established its tuners as among the best around over the past year, and pictures the 52HX903 receives are prodigiously detailed, beautifully lit and move with assurance. There's noise at times, of course, and a mix of complex patterns and movement can provoke jaggedness, but the Sony bears comparison with any flatscreen that we've seen at any price. The same applies to upscaled DVDs. 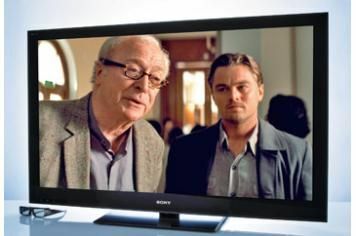 Confident with motion, natural with skin-tones and with tremendous detail and variance to dark or black scenes, the Sony's got the sort of all-round ability to make you discover your DVD collection afresh. Contrast is clean and strong even in the most testing moments, and edges stay smooth and believable even during rapid motion. Most impressive of all is the understanding of lighting the HX903 demonstrates – it's incredibly subtle and natural in this regard. The full HD resolution of Blu-ray gives the Sony even more chance to show off. Punchy white tones, blacks so inky they blend seamlessly into the screen's glossy black bezel and an heroic level of detail retrieval make watching the HX903 an uncomplicated delight. Add secure motion tracking and a splendidly neutral suite of colours and it's clear the HX903's a screen to be reckoned with. It even fights shy of Sony's more typically thin and abrasive sound. Once you've negotiated your purchase of transmitter and glasses, the exceptionally crisp and dynamic 3D pictures the Sony's capable of can be thrilling. Coraline is a fairly bright, generously detailed watch, and while the HX903 is as susceptible to motion-bothering cross-talk as any other LCD design we've seen, it at least maintains a vivid appreciation of colour and texture. So while it looks expensive in the first place, and gets more expensive the more of its performance you seek to exploit, the 52HX903 is nonetheless an exceptionally talented TV.